Russell, Malinda. A Domestic Cookbook: Containing a Careful Selection of Useful Receipts For the Kitchen. Paw Paw, Mich.: The Author, 1866. Title Page. More than 300 cookbooks from the Janice Bluestein Longone Culinary Archive (JBLCA) have been added to Hathi Trust over the past several years. As Black History Month comes to a close, we take the opportunity to highlight one very special cookbook made available in digital facsimile in 2015: Malinda Russell’s A Domestic Cook Book: Containing a Careful Selection of Useful Receipts for the Kitchen. Published in Paw Paw, Michigan in 1866, A Domestic Cook Book... is the oldest known cookbook authored by an African American. Found among the collection of California cookbook author and food writer Helen Evans Brown, this little book precedes Abby Fisher’s 1881 What Mrs. Fisher Knows About Old Southern Cooking by 15 years, making it a landmark in African American culinary and publishing history. However, it should be noted that two earlier household/hotel manuals by African Americans are known: The House Servant's Directory (1827) by Robert Roberts and Hotel Keepers, Head Waiters and Housekeepers' Guide (1848) by Tunis Campbell. Due to the generosity of JBLCA donor and adjunct curator Jan Longone, the JBLCA holds the only known copy of Malinda Russell’s cookbook. A slim volume of 39 pages in paper wrappers, A Domestic Cookbook... was an ephemeral publication to begin with. The fire that largely destroyed Paw Paw, MI later in 1866 likely destroyed many copies of Russell’s cookbook, and it has also complicated the process of learning more about the author. After acquiring A Domestic Cook Book, Jan and Dan Longone conducted research in Tennessee, Virginia, and North Carolina in an attempt to trace Malinda Russell, but ultimately were unable to be certain whether she was identified in the documents they found. All that is known for sure about Malinda Russell are the few details she chose to include in “A Short History of the Author.” Born and raised in Tennessee, as a member of “one of the first families set free by Mr. Noddie of Virginia,” Russell set out with a party destined for Liberia at age 19. However, when her money was stolen, she remained in Lynchburg, Virginia and found work as a cook, companion, and nurse. After a brief marriage, she was left widowed with a young son. Russell returned to Tennessee, where she kept a boarding house and later a pastry shop. When she was robbed again in 1864, this time by a guerrilla party, Russell determined to leave the south “at least for the present, until peace is restored,” and settle in Michigan. 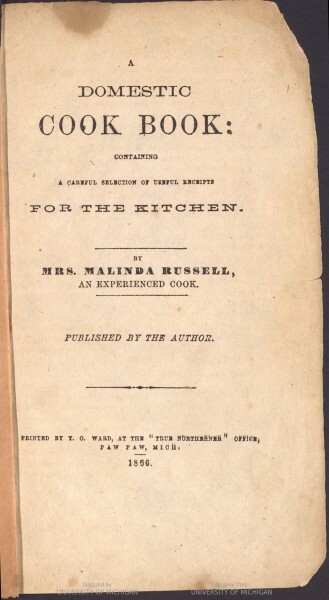 Russell states that she learned her trade from Fanny Steward, “a colored cook, of Virginia, and have since learned many new things in the art of Cooking.” She also notes that she cooks “after the plan of the ‘Virginia Housewife,’” which is most likely a reference to Mary Randolph’s popular and influential cookbook The Virginia House-wife (1824). Russell’s own cookbook consists primarily of desserts and baked goods, a logical focus, given her ownership of a pastry shop. Most recipes are for dishes common throughout the Eastern United States in the 1860s, but a few recipes such as "Sweet Potato Baked Pudding” reflect specifically Southern cuisine. Characteristic of many 19th century cookbooks, Russell’s receipts rely on a certain amount of shorthand and the assumption that the reader already knows her way around the kitchen. For example, the first page of A Domestic Cookbook offers a recipe for "Cream Cake" in a single sentence. "One and a half cup sugar, two cups sour cream, two cups flour, one or two eggs, one teaspoon soda; flavor with lemon." Russell provides specific proportions for the sugar, sour cream, flour, and baking soda, but assumes the reader will have enough familiarity with the viscosity of cake batter to judge the size of her own eggs and thus whether one or two are needed, and likewise to add flavoring to taste. One cup good sweet cream, the whites of three eggs beaten to a froth, one cup coffee sugar, the juice of one lemon. Bake with a rich under crust. On the same page as the cream pie, readers get a small taste of Russell’s personal voice as she offers advice on baking light cakes, something that was undoubtedly far more challenging in 19th century ovens than the gas and electric appliances we use today. In addition to culinary recipes, Russell offers several recipes for medicinal and personal care products. Her cologne is a heady combination of rosemary, lemon, bergamot, lavendar, clove, and cinnamon. Take oil rosemary and lemon each -4th oz., oil begamot and lavender each 1-8th oz. oil cinnamon eight drops, oils clove and rose fifteen drops, alcohol two quarts. Mix and shake well two or three times a day for a week. “After applying sweet oil, scrape the inside of a raw potato, lay it on the burn. In a short time put on fresh potato; repeat it quite often; it draws out the fire and gives immediate relief. We express our gratitude to Jan and Dan Longone for their insight in recognizing and researching the importane of A Domestic Cookbook..., as well as their generosity in donating it to the Janice Bluestein Longone Culinary Archive (JBLCA). Our thanks as well to JJ Jacobson, curator of the JBLCA from 2009-2015 for her dedicated efforts to prioritize access to this unique publication. And finally, many thanks to the Digital Conversion Unit and Digital Library Production Service, and especially Larry Wentzel, Kat Hagedorn, and Angelina Zaytsev, for their work in bringing digital facsimiles of both the original work and the print facsimile into Hathi Trust, where the only known copy of the oldest African American authored cookbook can be shared and enjoyed by all. I would a copy of this cook book. Hi Steven, Thanks for your interest! I'd be happy to send you a copy of one of our remaining physical facsimiles of this book. Please email Juli at jmcloone@umich.edu with your mailing address. I would also like a copy of the book, if available. I wouldn't mind a physical or digital version. Thanks! What a treasure. Thank you.